Note: this sermon was shared at the funeral for John Oestmann today. I offer it here for those unable to attend the service, but also for anyone who has struggled with an untimely loss of a loved one. I first met John Oestmann when I became the pastor at Prosper United Methodist eight years ago. And did this guy make an impression! It isn’t often that I am made to feel small around others—but John was a giant in every way you can imagine. 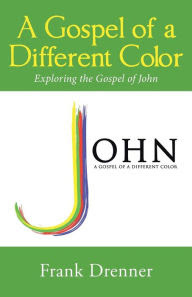 People always say, “Don’t judge a book by its cover.” Well, that was never truer than when one considers our husband, father, brother, son, and friend, John. Many of us might have crossed the street when we saw this large, tattooed, sometimes Mohawked man approaching us. And if we did cross that road, we would miss out on knowing one of the best, most genuine, most dependable men we would ever meet. But the lasting impression John gave had little to do with his appearance and everything to do with the way he lived his life. One of my favorite lines from Pulp Fiction is, “Just because you are a character doesn’t mean you have character.” We all know John was a character and had character. 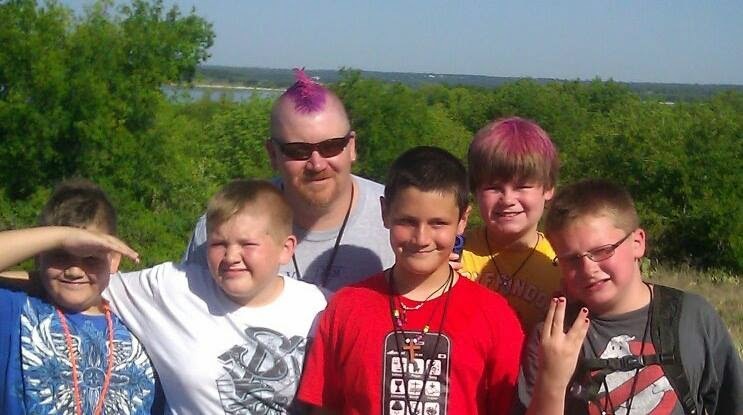 John, with his two sons James and Ethan (left), Peyton, Chance, and our James (back row). I have John to thank for the only times my son James ever painted his fingernails—when he was in Mr Oestmann’s cabin at Camp Bridgeport. John’s love of the church camp is legendary—so much that the camp itself posted a tribute to John on its Facebook page yesterday. I had always heard of John’s Bridgeport exploits second hand until this past summer, when Pastor Jason, John, and I were all at camp together, though in different cabins. John’s towering, unique voice could be heard from anywhere: “OMEGA!,” leading the cheers of his group. His presence at Bridgeport next summer and beyond will be dearly missed. Several years ago I began recruiting a new Disciple Bible Study class at the church, and one of my target couples was John and Angela. Angela remembered the other day me sending her 100s of emails asking for one good reason they should not participate. Finally she relented and she and John signed up with another dozen or so folks. We met every week in my home for nearly a year. And several years later, I can still say it was one of the best groups I have ever participated in—largely because of John. At the end of class when others were often uncomfortable praying, John stepped up. When the discussion bogged down, or we chased too many rabbits, John brought us back on track. When I was absent I knew John would faithfully substitute for me; and when I was assigned to another church in Dallas, I asked John to take on the teaching duties for the next year. Of course he excelled at it. John was skilled at his work as an electrician too. Several years ago I set up an above ground pool at the parsonage. John came over to convert the outlet to something that would work with water, potentially saving all of us from electrocution. When our boys needed ceiling fans installed this summer, it was clear Christy would not allow me anywhere near it—so we called John, of course. He picked Ethan up from Bridgeport, then spent a couple of hours in my sons’ rooms doing this job for us—Ethan hadn’t seen his mom or family in a week but John still made time to help us out. Our James was thrilled to have both Ethan and Mr Oestmann in our home. John was the ultimate husband and father. He cherished Angela: “Husbands, love your wives, just as Christ loved the church and gave himself up for her.” And you weren’t around John long before the stories of his kids’ latest achievements were shared. He was very, very proud of Ethan, James, and Lilah. John was a man of great faith, and his untimely death no doubt has caused many of us to question our faith. Many of us are angry—we have lost someone dear to us and we want answers. We may even direct that anger toward God—and let me say that is not only ok but healthy. God can certainly handle our grief. Shouting to God, “WHY?” is an act of prayer, even when we do not intend it to be. But trying to find answers in such a situation can also lead to frustration. John’s death is unfair but it was not caused by God—God did not take John from us or have any more important need for him elsewhere. God’s heart broke as much as anyone else’s last Friday. Scripture tells us that Jesus himself experienced grief in the face of death. Eleanor Roosevelt once said, “Life was meant to be lived.” This was how John approached his life, and it is the best way I can think of to honor his memory. There is a large, John-sized hole in our lives now—how can we fill that hole for each other, so that we can experience the healing power of love over the coming days? Maybe we can do that by being more available to each other—not just when things need to be fixed but the few extra moments of holding a hand or sharing an encouraging word. A few years ago I came across this quote from Earnest Hemingway, who, like John, was an avid outdoorsman. From his classic A Farewell to Arms, Hemingway said: “The world breaks everyone, and some become strong at the broken places.” My prayer for those of us who are broken today is that we will be made strong in those broken places. “Weeping may linger for a night, but joy comes in the morning” (Psalm 30:5). Angela and the rest of the Oestmann family, I am so glad that scripture is in such a prominent place in the home. There’s no better word for you today. Our weeping may linger, but joy is coming. At this time of year we anticipate God’s coming to us in Jesus Christ. Jesus said this: “No one will take your joy away from you.” And so may each of you—family and friends of John Oestmann—may each of you know that joy. May the God of joy wipe away your tears and bring healing and restoration to your life. May you know, as John did, the great promise of our faith, that nothing in life or in death can ever separate us from God’s great love in Jesus Christ. In the name of the Father, the Son, and the Holy Spirit, amen.